It’s Friday Fictioneers again with host Rochelle Wisoff-Fields. A story in 100 words! Here’s mine. There’s some nasty sharp edged stones on the Oodnadatta Track. They can ruin ya trip. ‘Did ya deflate the tyres Pete?’ I said. ‘Do ya think we should ask a local? They orta know.’ I said. Pete pulled into the only mechanic in town. He lifted his cap and scratched his head. ‘Yeah. What tyre pressure do you recommend?’ Pete said. I went to look for the dunny out the back. 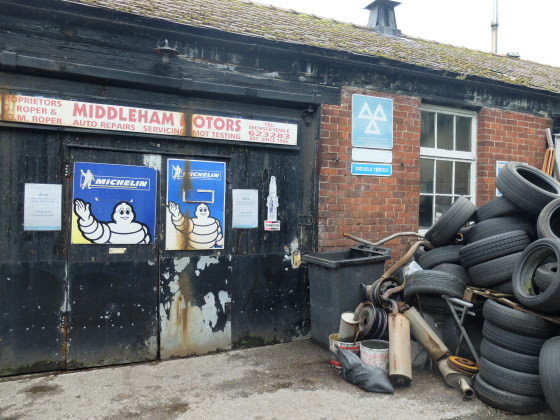 I stopped in me tracks when I saw a mountain of flat tyres.